This is a thick phone, but it boasts some impressive specs for a rugged handset along with a very unique feature – the FLIR camera. The S60 will be worth the asking price for its target audience. Sometimes, one standout feature in a smartphone can help it pull ahead of the crowd and become an almost instant classic. Caterpillar's Cat S60 smartphone almost manages to accomplish that feat thanks to a unique feature, a heat sensor, that transformed it into the world's first thermal imaging smartphone. 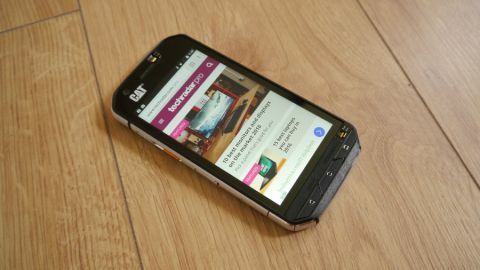 Available for pre-order from Cat's own website (or Ebuyer) at just under £530 (around $695, AU$930), the S60 is not cheap but is certainly one of the best, if not the best, rugged smartphone on the market right now, with specs to match a mid-to-high-end smartphone. Just as a reminder, the BlackView BV6000, which is another rugged phone with very similar specs bar the FLIR camera, costs about £150 (around $195, AU$265) but it doesn't have the cachet of the S60, plus it lacks a few important points (the above and below images show these two models side-by-side). So for about a tenner less than the Apple iPhone 6S, you get a phone that is both robust and significantly faster than all rugged smartphones on the market. This handset might be big (222g and a thickness of 12.66mm) but it is very well constructed, feeling reassuringly solid. It has a strengthened die-cast frame that gives it a polished look and allows it to be dropped from 1.8m. Volume rocker buttons can be found on one side while the power button, a yellow programmable button and three flaps are on the other. The first flap hides a red SOS button which, on pressing, sends your location to pre-listed contacts. The second one covers the USB port and the third one protects the audio connector. It is the first smartphone we know of that comes with a headphone socket on the side. The top of the handset is occupied by the FLIR thermal camera – which protrudes slightly – with an optical camera and a flash located below it. Turn the phone over onto its textured back and there's the unmissable Cat logo and a hinged flap that hides the microSD card and the SIM card. Flip it over and the front shows the Cat logo again as well as three physical buttons and two toggle buttons which Cat calls the lockdown switches. Flip them and the phone will be able to work underwater (but not make calls) at depths of up to 5m for up to an hour by sealing the front speaker and microphone – without this measure, you're only covered up to 2m. The 4.7-inch display is an HD a-Si AHVA model and while using Gorilla Glass 4 makes it super resistant, it is prone to attracting fingerprint smudges. Note that you will be able to use it with gloves and in a wet environment. So this is a phone which offers a good level of grip, won't slip out of your hand easily, is waterproof and, according to its manufacturer, exceeds military specifications with its IP68 certification, making it impervious to water and dust. The thermal micro camera used is a customised FLIR Lepton which is accessed separately using FLIR's @work app. The latter can be used to take pictures and make videos. Additional apps, like the FLIR tools mobile, can increase its functionality. Alternatively, Cat has a curated list of applications available via an App Toolbox. These include farming apps, construction apps and more. You should be able to see through thin walls and the app colours in spots with different temperatures in real-time. That means that colour shifts happen when something abruptly becomes far warmer/cooler than the rest of the environment. It can deliver temperature readings to an accuracy of one decimal point and, according to Cat is accurate to a maximum distance of 30m and can do night vision as well. In use, we found out that the nearer you are to the targeted source, the higher the temperature would become. Temperature reading also depends on whether the target has a matte or a glossy finish as this has an impact on heat dissipation. As for the rest of the specification, it includes an 8-core Qualcomm MSM8952 SoC, 3GB of RAM, 32GB on-board storage, a microSD card slot, a 3,800mAh battery with Quick Charge 2.0, a 13-megapixel rear camera with dual LED flash, along with a 5-megapixel front-facing one. There's also Bluetooth 4.1, NFC, 802.11n Wi-Fi, dual SIM, a speaker capable of delivering 105dB, FM radio, GPS/GLONASS/Beidou, LTE Cat4 and stock Android 6.0 Marshmallow as the OS. The display of the S60 is brighter than expected and the fact that it is HD only didn't bother us during the brief time we had with it. However, the small size of the display (4.7-inch) could cause a problem for someone with big hands wearing gloves. Testing the phone under Antutu yielded a score of 45,654 marks which is almost identical to the MTK6755 found in the Blackview BV6000. As expected, this is powerful enough for most tasks and we didn't encounter any issues with sluggish apps or non-responsive pages. Let's be honest, this is not your average boring Android smartphone. It is thick and expensive but its unique selling point more than makes up for all this. This is a handset with a thermal camera – and a standalone FLIR thermal camera costs £200 (around $260, AU$350) by itself, and obviously doesn't offer the same level of integration. Then there's the fact that it is the most powerful rugged smartphone on the market, one that not only boasts IP68 certification but also does it in style. If you work in the construction industry or you're in the market for anything that requires an extremely sturdy smartphone and a portable thermal imaging camera, then choosing the Cat S60 is an absolute no-brainer. For the rest of us, it is an expensive gadget, the novelty value of which is likely to wear off after a few trips to show it off down the pub. That said, it's a great handset if you are fed up of cracking the screen of your expensive phone and having to fork out a couple of hundred quid to get it repaired every time you drop it in the aforementioned pub's toilets.